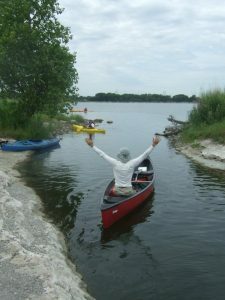 Paddlers are welcome to launch their own crafts from the south entrance of Wolf Lake. Visitors may rent kayaks, canoes paddle boats or stand up paddle boards on-site for $5/hour. Life flotation devices, which are included with rental, come in adult and child sizes. Canoes, single- and double-kayaks are available. Header photo by Julia Schweitzer, Wilderness Inquiry.